Have you ever been to Rajasthan? If you haven’t then you have surely missed one of the best tourist destinations in the world. Very few places other than Rajasthan offer so much variety in terms of tourist attractions. As a result, it attracts various kinds of tourists from different parts of the world. Tourist attractions in Rajasthan include natural beauty, historical significance, religious importance and many others. Ranging from natural wonder to man made marvel, Rajasthan’s tourist attractions manage to provide a thoroughly enjoyable tour to tourists. Moreover, tourists also come all the way to Rajasthan to explore the rich culture of the place. This has actually played a vital role in making the fairs and festivals in Rajasthan all the more popular. There are a number of fairs and festivals held in Rajasthan. The various festivities in Rajasthan are celebrated with a lot of enthusiasm. The Mewar Festival Udaipur is one of the most famous festivals in Rajasthan. This festival is celebrated to mark the beginning of the spring season and is an integral part of the culture of the place. Udaipur as a city has a great historical significance. It has the history of being ruled by the Sisodia dynasty for nearly 1200 years. Maharana Udai Singh is regarded as the founder of the city. According to popular beliefs, one day as the Maharaja was busy in hunting adventure; a holy man was meditating on a hill near Lake Pichola. He blessed the Maharana and also suggested him of building a palace. He also suggested Maharana to build the palace at the place where a stream covered the fertile valley. During the process of following his advice, Maharana founded the city in the year 1559. The city with such a rich history is bound to be a great attraction for tourists. Add to it, the attraction of Mewar Festival Udaipur, this place has turned into a truly great place for tourists. The Mewar Festival Udaipur celebrated to mark the onset of spring has a lot of resemblance with Gangaur festival. However, the unique charm of the Mewar Festival sets it apart from others. Moreover, unlike most other festivals, this festival has both cultural and religious significance. Cultural activities like the women folk dressed in bright attires is a distinct feature of the festival. These women gather at one pint and wonderfully dress up the images of Ganagaur and Isar. These images are later taken out for procession. The procession travels through various parts of the city and move towards the Gangaur Ghat at Lake Pichhola. On reaching there, these images are placed on special boats. This actually marks the beginning of the festival as people of Udaipur engage themselves in singing and dancing. Hence, it is a perfect blend of religious and cultural activities. Tourists visiting the Mewar Festival Udaipur have a gala time while witnessing the various cultural and religious traditions of the place. The festival ultimately ends with spending fireworks. Get your tour booked as soon as possible. 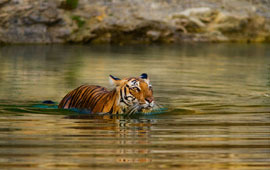 It will add a lot of value to your Rajasthan tour. Try to plan your trip to Rajasthan during the time of the festival. It will truly be one of the most memorable experiences of your life. 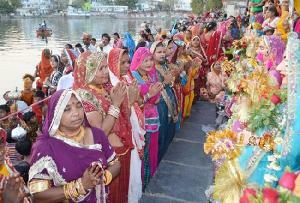 Indianholiday.com offers online information on Mewar Festival, Udaipur and other Fairs and Festivals of Rajasthan.